For more than ten years now, I have made challah almost every Friday. I have made challah in three different cities, while raising three different children, and trying to keep at least three goldfish alive—alas, unsuccessfully, I must add, for those poor goldfish. I have made challah while mourning the loss of my father, while helping a friend through her cancer diagnosis, and while nursing many a child’s wounded knee and wounded pride. I have made challah while working as a busy physician at one of the world’s top hospitals and while working as a stay-at-home mom who could never get my kids out the door properly dressed for the bitter Midwest cold. I have made challah alone and with other women—some of them my dearest friends and some I had not even met before we started to bake bread. Why have I persisted each Friday to make challah for hundreds of Fridays and counting? Because countless demands on my time and energy overwhelmed me. Because one night I even convinced myself that running in place in the upstairs bathroom while I sorted the day’s mail counted as exercise. Because as a physician I know all too well that stress like this makes us sick—not just theoretically sick, but actually sick. Because I learned I could change this pattern. In taking this time each Friday to sink my hands in a bowl of dough, I learned that I could stop for a half hour and breathe while I cracked eggs and measured flour. I could stop and make something nutritious and delicious with my own hands and, in the process, I could reconnect with myself and with other women. I could find some happiness in this mixed-up, fast-paced world. I could, in other words, be present—and (drumroll) so can you. I wrote this story as part memoir, part cookbook, and part manifesto. I wrote this for all the women who are carrying a myriad of responsibilities and not taking even a few minutes to stop and smell the rising yeast. It started for me one Friday morning when it was unclear whether I was going to be OK, and now has sustained me for ten full years. This book is my recipe for how to do it—how to make the bread and take the time you need to take to be truly well. I used to just prescribe medications such as calcium channel blockers and beta-blockers; now, I also prescribe baking challah. Don’t think you have time to stop for a few minutes and bake bread? Maybe you have a mandatory meeting, a work commitment, a child to pick up, an errand to run. I get all that; I have all that on my calendar, too. But I also know that you can figure this out, and that once you do, you will be amazed at what getting your hands in a bowl of dough each week will do for you. It will impact your body, your spirit, your friendships, and your family. It will get you to slow down, to chill out, to tune in. It will change things at the exact level I suspect they need to be changed. So take a breath, open up your cupboard, get out your bowl, grab the six ingredients, and start mixing. Oh, and take another breath. 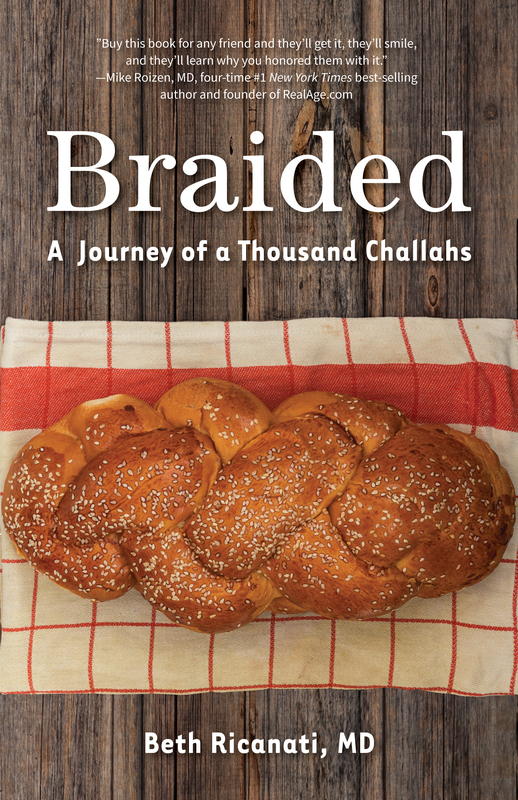 Excerpted from Braided: A Journey of a Thousand Challahs by Beth Ricanati, MD. © 2018 by Beth Ricanati, MD. She Writes Press, a division of SparkPoint Studio, LLC. internal medicine residency at Columbia Presbyterian in NYC. She spent ten years in practice at the Columbia Presbyterian’s Women’s Health Center, the Cleveland Clinic’s Center for Women’s Health, and the Cleveland Clinic’s Wellness Institute. In addition to the frequent online writing that she does now, Ricanati has been a guest contributor for television, print, and online media, and has published medical articles in peer-reviewed journals.